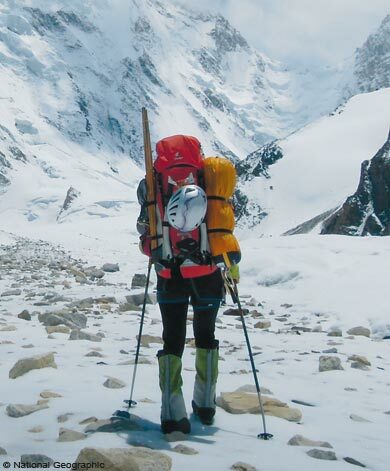 She has conquered 14 of the world’s highest peaks – all oft hem without using artificial oxygen. Gerlinde was introduced to the world of mountains and mountaineering by the leader of the youth group in her Upper Austrian home town, the Parish Priest Dr. Erich Tischler in Spital am Pyhrn. During her schooling at the secondary school with emphasis on sking in Windischgarsten, Gerlinde – at the age of thirteen -made her first easy climbing tours. Skiing -, ice- and climbing tours became her main interests, which she pursued enthusiastically while studying in Vienna to become a nurse. In 1998 she made her first ascent of an 8.000 m peak, the Cho Oyu. 2001 followed the successfull ascent of Makalu and from then on Gerlinde traveled year after year to the Himalaya mountains and ascended one after the other gigantic 8000+m peaks. This makes thirteen of the fourteen 8000m peaks which Gerlinde Kaltenbrunner has ascended without using artifcial oxygen. In May 2008, while attempting to ascend the Dhaulagiri, she was caught in a slab avalanche and barely survived - thanks to an air-bubble - until she was able to dig herself out of the snow masses. In spring 2009 she tackled Lhotse which she conquered on 20th May 2009 – her 12th ascent of the fourteen 8 000m peaks. And since then she belongs to the group oft he most successful female mountaineers, together with Edurne Pasaban, Nives Meroi and Oh Eun-Sun. OnMay 24th, 2010 Gerlinde Kaltenbrunner ascended the Mount Everest together with Ralph Dujmovits – but had to climb the last section to reach the summit by herself as Ralph had to quit due to health problems. 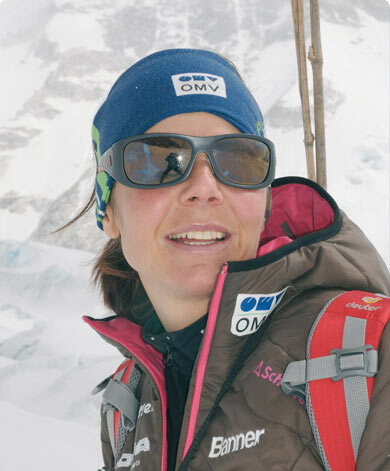 During her second attempt to conquer K2 – on August 6th 2010 – Fredrik Ericsson -who joined her in the attempt to ascend K2 – fell 1000m and was killed. Gerlinde who saw Ericsson fall aborted the summit attempt. K2 is the one peak which remains to be conquered by Gerlinde in her attempt to climb all fourteen 8000m summits – without using artificial oxygen. On Tuesday, the 23rd of August Gerlinde reached the summit of the K2 at her 7th attempt and therefore is the first woman having conquered all 8.000 m peaks without artificial oxygen. The exceptional achievement of this determined and friendly lady mountaineer touches the whole world. 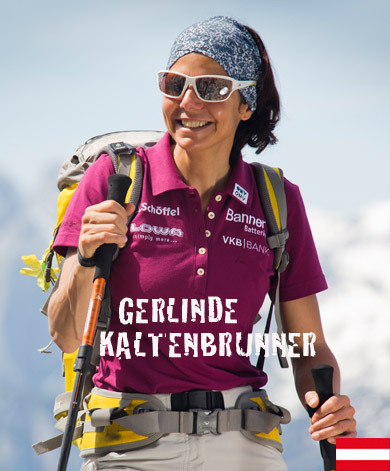 On Tuesday the 23rd of August 2011, Gerlinde has reached the summit of the K2 (8611 meters). After several attempts Gerlinde has now as first woman conquered ALL 14 – 8.000 m peaks worldwide without using artificial oxygen. All members of the KOMPERDELL team congratulate her warmly. We are very happy about this extraordinary success. For 2012 Gerlinde Kaltenbrunner and her husband Ralf Dujmovits planned the first ascent of the Nuptse East-Ridge (Nuptse, Lhotse and Everest form a gigantic horse shoe, 2 parts of which have not yet been ascended). Together with David Göttler, Gerlinde reached the summit of Nuptse on the 17th of May 2012. Now she is the first person having climbed all three peaks of the horse shoe without artificial oxygen. Currently the couple is working on an illustrated book which will be published in autumn 2012.